ARC Disclaimer: I was not paid in any way by the publishers to review this book favourably. The review is my own honest opinion (Whether or not it is agreed with). In the Community, there is no more pain or war. Implanted computer chips have wiped humanity clean of destructive emotions, and thoughts are replaced by a feed from the Link network. When Zoe starts to malfunction (or "glitch"), she suddenly begins having her own thoughts, feelings, and identity. Any anomalies must be immediately reported and repaired, but Zoe has a secret so dark it will mean certain deactivation if she is caught: her glitches have given her uncontrollable telekinetic powers. As Zoe struggles to control her abilities and stay hidden, she meets other glitchers including Max, who can disguise his appearance, and Adrien, who has visions of the future. Together, this growing band of glitchers must find a way to free themselves from the controlling hands of the Community before they’re caught and deactivated, or worse. 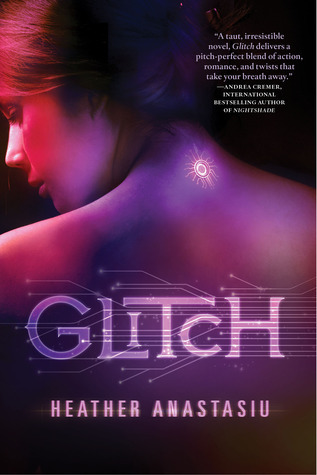 In this action-packed debut, Glitch begins an exciting new young adult trilogy. Where oh where to start with my review of Glitch? This is a book that screams originality. The idea behind the book is part The Giver, part "Matrix" and part I can't compare it to anything else that it's so unique. The plot is far from farfetched for a dystopia as this is the kind of thing that I personally could see happening, it is also something that I've even thought about and feared about for the future. The plot isn't the only originality to the story, what I also felt was original was the structure of the storyline. Parts of me felt it was brilliant, while other parts didn't know if it was entirely necessary. Its set up was two parts, with the main character forgetting the entire first part when the second part came around. As I said, part of me liked this, but a bigger part of me kind of wished that the book had started midway through with her getting flashbacks that she and we cannot understand (sorta like others in the story). I also wasn't quite sure if the adding of "special mutant abilities" to the glitching was really necessary, though I guess it is used to push the story and is very important in the case of Max. One thing I did adore about the book, however, is the introduction of emotions to Zoe and even Max. I thought that the author pulled that off brilliantly. Another thing is the world building done in the book, I love the whole idea of the V-chips and how they work and how they were implemented. The "betrayal" of Adrien was way to obvious to be fake and that is an issue I had, and I think this has a lot to do with the way the book was structured. If Glitch had been structured so that we begin after she loses her memory so we don't know if we can trust Adrien or not, it'd have a bigger impact and we wouldn't know who to believe. That part also happened so fast and I wished it had been dragged out longer. Not to mention, I'd love to know why the Chancellor's power just happened to not work on Zoe when her power is just supposed to be Telekinesis. On the other hand I felt like Max was such a perfect foil to Adrien. He has no idea about emotions except that he enjoys pleasure and honestly I wonder how it would be to be a teenager and hit by hormonal feelings out of the blue. I also know that the ending had me wondering how things were going to continue. It is the start of a great rebellion and I can tell and I love watching such rebellions put through, I also wonder how the Chancellor will cause problems in the future. I recommend this to any and all Dystopia lovers. It has excellent world building and the writing is well done in my opinion. I'm still two ways about the structure, but I am also biased towards less linear storytelling. I also recommend this to people who want to read something different and a dystopian book that is more similar to The Giver, as I feel like there are very few of that type around anymore. I'm so tempted to read the spoiler section, haha, but I have this book waiting for me on Netgalley (yes, I love them too!) so I'm not going to spoil it for myself. Thanks for the review! ^^ and I'm glad that you liked it so much! I think the reason the power didn't work on her will be shown later in the next one. Great review! I reviewed this one too. My Review! I am a new follower! Still. there is some good. The concept itself is good. The last few chapters were excellent when Adrien's slang wasn't spreading like a virus. None of the good aspects were enough for me to really care about going forward with the series though. In the end the bad beat out the good.